Flush in money after the ludicrous success of James Cameron's Avatar, 20th Century Fox has reportedly locked down actor Will Smith to return for a pair of sequels to the 1996 blockbuster Independence Day (aka ID4). It may be hard to think back to a time before the incredible success of Avatar, The Dark Knight, Pirates of the Caribbean and Titanic, but there was in fact a point when the second-highest grossing movie of all time was a little action blockbuster called Independence Day. 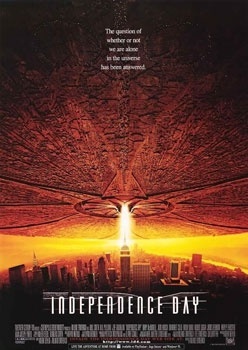 Released in 1996, ID4 told the story of humanity's resistance against an alien invasion of Earth, and went on to gross some $816,969,268 at the box office worldwide. With that sort of success, it's no wonder that Hollywood big wigs have been wanting to make a sequel for quite some time, but there was a catch. While the film's stars Will Smith, Jeff Goldblum and Bill Pullman were all decently well-known at the time, Mr. Smith has become quite a bit more successful since 1996 (in part due to the success of ID4, ironically) and is now one of the most expensive movie actors around. 20th Century Fox executives were unwilling to shellac out the cash necessary to get Smith on board for an ID4 comeback - at least, they were unwilling to do so before James Cameron's Avatar left them swimming in moolah. Now, reports IESB, Will Smith has reportedly been locked into not one but two ID4 sequels, which will allegedly be made back-to-back (like the Lord of the Rings films, or the second and third parts of both the Matrix and Pirates of the Caribbean trilogies). The film will supposedly be directed and written by the original ID4 duo, Roland Emmerich and Dean Devlin (respectively), and given that Emmerich just recently flexed his disaster-movie chops in 2012, should feature lots of things blowing up very, very prettily. According to IESB's sources, though, production on ID4-2 will have to wait until both Emmerich and Smith are done with their current projects (Emmerich is directing Shakespearean thriller Anonymous, while Smith is working on either The City That Sailed or Men in Black 3). I'm not sure what exactly the story could be for another ID4, let alone two of them. The aliens return, we fight them off again - twice? What gives? But I do know that I loved the hell out of the first movie, so maybe they'll be guilty pleasure popcorn flicks. Actually, I'm pretty sure there's no "maybe" there at all.